The second set of Twitch Prime-exclusive skins for PlayerUnknown's Battlegrounds is now live. 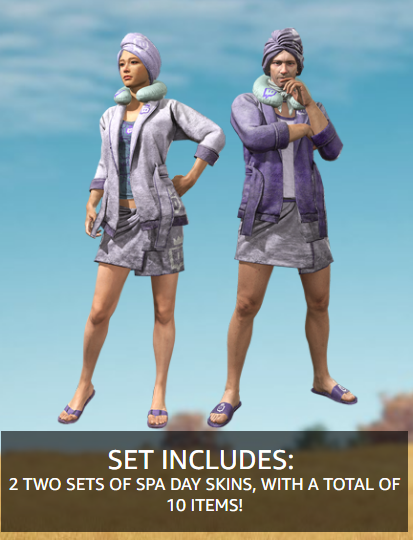 They are appropriately Twitch-purple, but less appropriately encourage some R & R. The "Spa Day" set will suit up your player character for a day of kicking back in the shade as opposed to gunfire and death. We're not sure why you'd want to wear nothing but a towel when fighting for your life against 99 other people, but hey, this set and the previous Deadmau5 set are both completely free for Twitch Prime members, so why not? The set comes complete with purple Twitch sandals, a towel, a robe, an undershirt, a towel headwrap, and a Twitch neck pillow. If you're a fan of Twitch, purple, ridiculous spa outfits, or running around the map looking like the building fire alarm went off while you were in the shower, then these are the skins for you. To get access to the skins, first you must be a Twitch Prime member, which comes free with Amazon Prime. Then you must link your PUBG account with your Twitch account by clicking the Twitch "Glitch" logo in the top right of the game's main menu. At that point you will follow the instructions to link your accounts and navigate back into the game. Once in game, move to the Store tab and you should find the new gear in your inventory. According to the Twitch Prime set, there are still three sets of PUBG items that have yet to be announced, so stay tuned to see what you'll be wearing next in Erangel, Miramar, or Sanhok.